So it’s the start of week three on the trail, and I’ve seem to hit a bit of a rough patch as far as adaptability of my body to the conditions of the trail. Nothing a pair of new shoes from the hiker box and a double zero can’t solve, right? 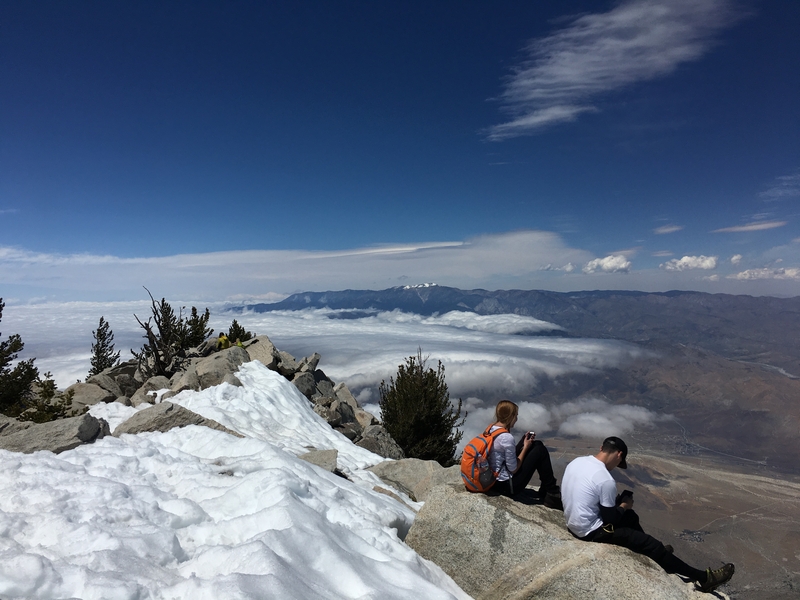 Then we get back on the trail in hopes of summiting San Jacinto, a nearly 11,000 ft mountain in Southern California. Things are going pretty well, it’s a beautiful day despite larger amounts of snow that make the trail hard to find at times. 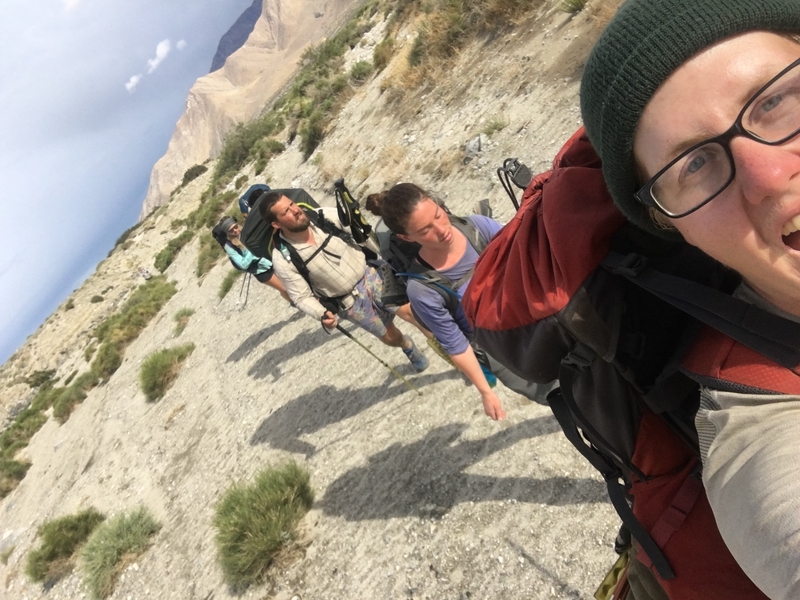 I’m enjoying the physical challenge of climbing to a higher elevation, and the sensation of passing day hikers becomes delightful. “Are you camping up there?” They ask when they see our packs. Then, as we summit, I finally get the chance to take off my pack just in time to notice a ping pong ball size growth on my shoulder right where my pack strap rests. It’s painful to the touch, and seems like it’s full of liquid, but what else can I do but readjust my pack so it’s resting on my hips and hope the swelling goes down? Finally at the top of San Jacinto, just in time to bolt down the mountain to avoid the incoming storm. Here’s where it gets good. Real good. Anyone ever have a urinary tract infection? Imagine the sensation of needing to pee, ALL THE TIME. But irony is a cruel mistress and every time you try, you can’t. Now imagine that you’re wearing a pack that weights 30 lbs. That pack has a hip belt that stretches perfectly over your bladder and is now cinched tight to help alleviate shoulder discomfort. And every time you go to take a step, the sensation of needing to pee is so strong that it stops you in your tracks. Oh, and you have to walk 21 miles today. But again, irony is a cruel mistress, and every time you go to urinate nothing seems to happen. You’re 3.5 mile an hour pace suddenly slows to 2. When you finally stumble into camp later than your comrades with a strong discomfort in your gut and seek the comfort of your warm quilt, the need to pee intensifies and keeps you running back and forth from your tent all night trying to make it happen. Oh trail, how you test me with your odd twists and turns of cruelty. Despite the UTI, I’m having a great time surrounded by good people. Not to worry friends, we’ve finally made our way to Big Bear where there’s modern medicine and clean conditions. The ping pong ball has diminished in size and pain and my feet are loving the size 1.5 larger shoes, and soon the UTI will be a thing of the past (fingers crossed!). In the meantime, here’s a positive update of the trail so far. We reached mile 200 at the beginning of week three. We’re happy with our pace but realizing we don’t need to move so quickly to get to Kennedy Meadows and the intense snow melt that awaits us. Cooper earned a trail name! While climbing San Jacinto, his sure footed nature and ability to climb without an iota of exhaustion was comparable to that of a Bighorn Sheep. Add in the irony that despite having looked for them for quite some time he’s never actually been able to find one, and you have his trail name: Bighorn. We camped in snow for the first time, and boy am I glad I moved to Minnesota. It was such a beautiful sight in the morning and a great change of scenery from the desert floor, but negative temperatures and inoperable fingers made for a tricky morning. Having had the opportunity to get use to snow over the past two years made a world of difference when trying to adjust my frozen trekking poles or tie the laces of my frozen boots. That’s all for now. Thanks for staying up to date on our journey, and we’ll be sure to update again as soon as possible! You are lucky in a way, in that some UTIs BURN. OUCH OUCH OUCH, JUST KILL ME NOW, BURN! So happy you got meds pretty quickly! Push that water, regardless ? Alexa I’m loving your blog! I’m so excited for you. And the UTI experience – wow and UGH! I’ve had many of those and cannot even imagine having one while still having to hike 20 more miles. If you can make it through that, you can make it through anything!!! Press on – I’m enjoying your journey from Encinitas.